Delta Scizor (referred to as just Scizor in-game) is a dual-type Ice/Fighting Delta Pokémon. It evolves from Delta Scyther when traded holding a NeverMeltIce. 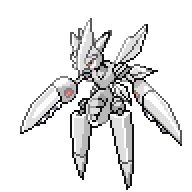 It can Mega Evolve into Mega Delta Scizor using the Delta Scizorite. Its exoskeleton is coated with a thick layer of ice. The layer of ice reforms once per year. 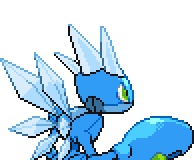 A level of "Start" indicates a move that will be known by a Delta Scizor obtained at level 1. 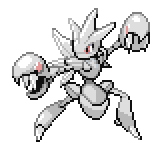 Prior to Generation 7, no other Pokémon had the same type combination as Delta Scizor and its pre-evolution. 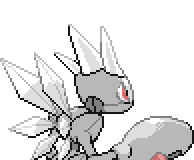 Delta Scizor shares its species name with Kingler and Scizor. They are all known as the Pincer Pokémon. Despite having different base stats, Delta Scizor and its pre-evolution both have a base stat total of 500. In turn, Delta Scizor and its non-Delta counterpart are the only Pokémon to not have their base stat total changed upon evolving. 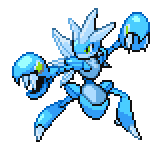 Mega Delta Scizor has the highest base Defense of all Fighting-type Pokémon. This page was last edited on 29 April 2018, at 23:10.